Do you remember back in September when I went raspberry pickin' with my wonderful friend Adrienne. 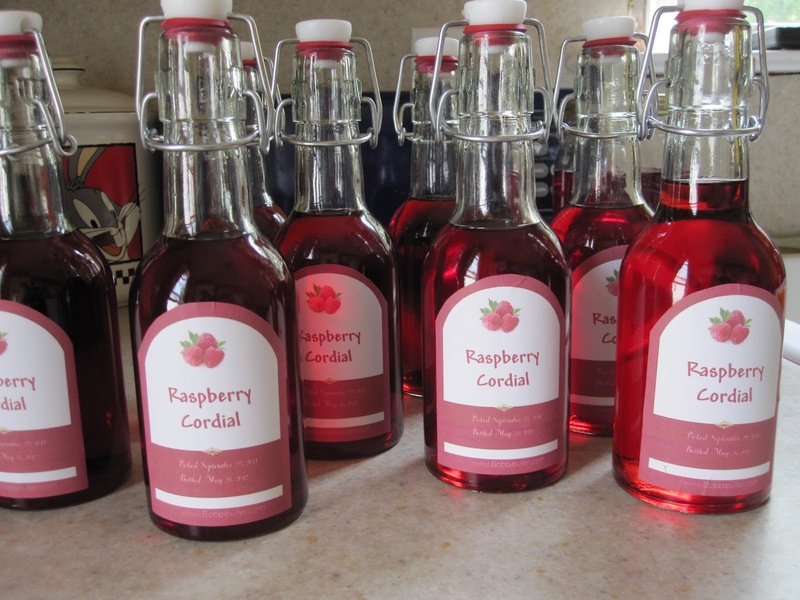 I took one of those quarts of raspberries we picked and made a batch of raspberry cordial. 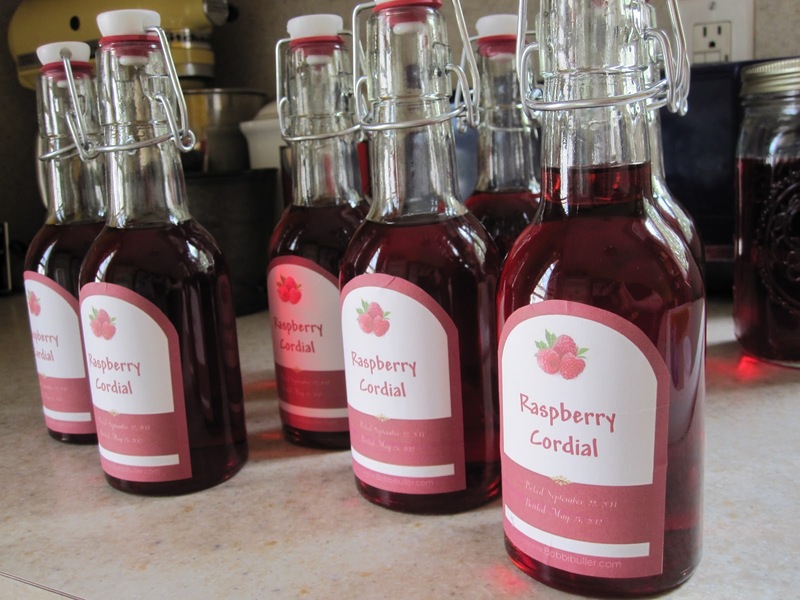 I really don't think I have ever tasted a cordial before, but I've seen the cute little glasses at antique stores and such before. I would love to find some with a chicken or a bee on them! When I found a recipe for making cordial with different types of fruit I was intrigued. I mean, come on, fruit, vodka and sugar syrup, what's not to love! I first soaked the berries in vodka for about 30 days. I wish I would have taken a picture of it, cause the berries turned white and were a perfect Halloween decoration. It looked like a bunch of little brains floating in red liquid! 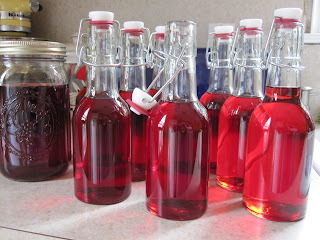 After straining out the berries I added a sugar syrup and that had to sit for 6 months! Finally it is here and the bottling is done! I did take a taste as I was bottling and it was not bad at all! My labels weren't the greatest but I was trying to be a little frugal and used some shipping label stickers that I had on hand. I can't wait to give a bottle to Adrienne! If not for her this raspberry adventure would not have happened. Maybe tonight I'll drizzle some over ice cream! 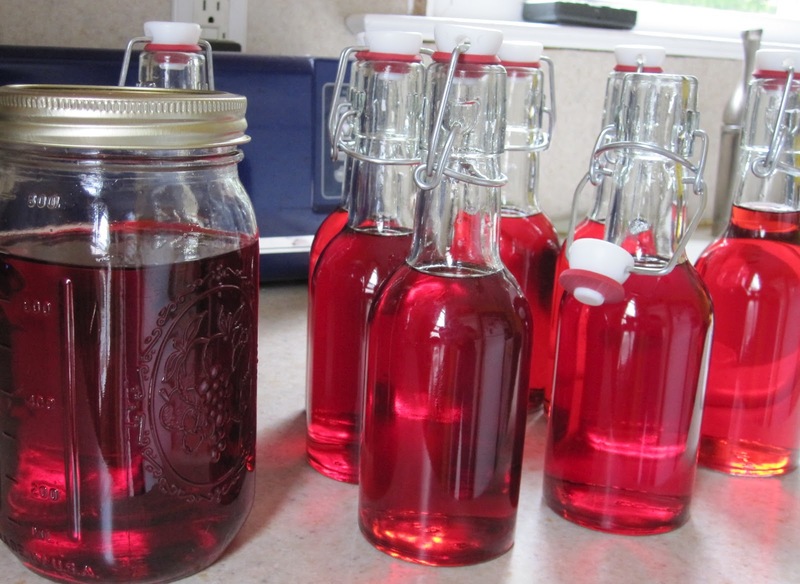 Oh my gosh, Bobbie...we have a 2 qt jar filled with vodka and raspberries in our fridge! It has been there so long I can't remember if it has sugar in it or not! Hmmm, I better try it and see...yours sounds yummy.